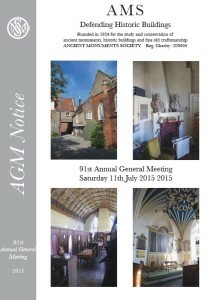 The 91st Annual General Meeting of the Ancient Monuments Society was held at on Saturday 11th July 2015 at 3.00pm in the Birkbeck Hall at The Great Hospital, Norwich by kind permission of the Master, Air Commodore Kevin Pellatt FCMI RAF. The Great Hospital is a really special building – founded in 1249, it retains a very fine chapel and the remarkable Eagle Ward shown on the front cover of the AGM Notice. We were pleased to see so many members and their guests attending and would like to thank the Great Hospital, Norwich for hosting a splendid event.